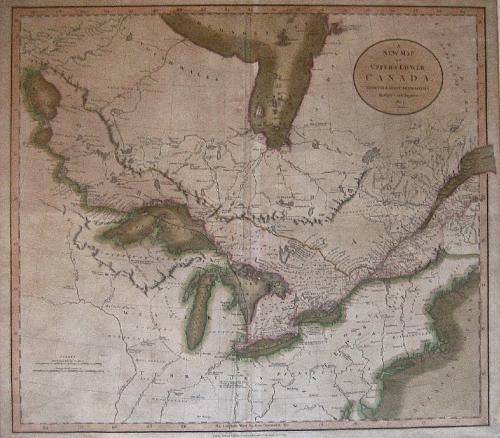 Includes several annotations in Ohio and New York, along with remarkable detail along the River and Lake System between Lake Superior and Lake Winnepeg. A nice example of the 1st edition of this map. One of the best large format English atlas maps of the period. John Cary worked from London as a mapmaker, engraver and publisher, towards the last quarter of the 18th century up to around 1830. Cary’s New and Correct English Atlas, first published around 1776 set out his stall as a serious mapmaker, focussing less on the decorative work of previous generations, and more on accuracy, quality and detail. Cary’s observations of what was required of maps at the time was astute and telling, reflecting the changing socio-political times of the changing century. With heavy industry around the corner, transport needs and the resulting communications were rapidly progressing beyond the established mapping. To showcase his newly communications-embellished county maps, he took on from Robert Morden, publishing in the already established atlas, Camden’s Britannia in 1789. Soon after this success, Cary was commissioned by the General Post Office to measure the mail-coach roads, again, adding to his knowledge and practical precision in his work. He then worked for some years for the Ordinance Survey, using some of the same material he used for Camden's. Ever efficient, he used the same plates for his own large atlas, Cary's New Universal Atlas which he published first in 1808 and subsequently for another 7 issues, the last two after his death. Consistency abounds in his work, and somewhat surprisingly, his plates were all of copper, at a time when steel plates were increasingly favoured by mapmakers for their durability and greater possibilities within the engravings. Using copper well into the 19th century gave Cary maps the feel of an accurate steel engraving, but with the soft aesthetic look of the maps that can only come from copper. After his death in 1835, Cary's sons continued in the business, working together with, and eventually selling the plates to other London mapmakers like John Tallis, James Wylde and John Rapkin who, no doubt, recognised the quality of Cary’s contribution to cartography as the highest of benchmarks from which they could work.